Added on September 11, 2008 by Sara Distin. The Twin Towers were never part of the NYC skyline that I know. I moved here in 2006, well after they fell. The Chrysler Building is instead, my landmark; it usually hovers in my peripheral view as I walk home on the far side of the East River. It is lit up in the evening and glows in memory when I am not here. 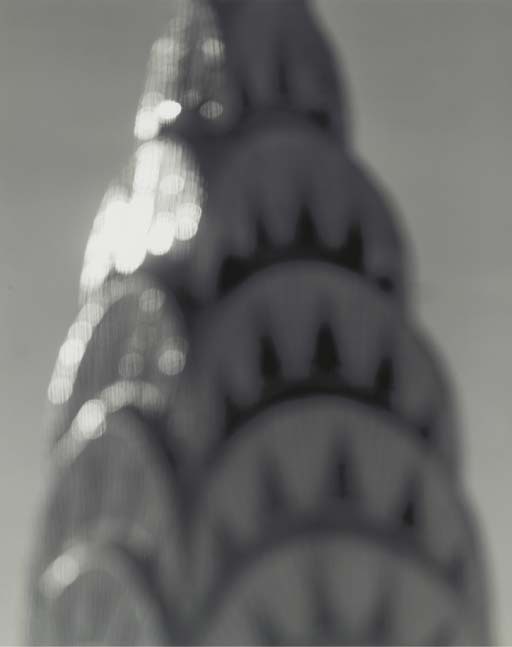 As a memory, it mimics Hiroshi Sugimoto's photograph, Chrysler Building, from his Architecture series to the point that I am unsure of which I saw and knew first, the building or the photograph. Somewhere along the line, my memory of the building became inextricably linked with this photograph of the building. I mean this to the extent that the actual Chrysler Building has become mythological. Looking at it, I get the same feeling I got when standing in the Parthenon and realizing just how the Greeks believed in their gods and feeling that I could have (and maybe did in that moment) believed in Zeus and Athena and Demeter and Dionysis; all as marble and stone continued to crumble.